HA HA! No, not really. In fact, nobody has ever said anything remotely like that to me. (The closest I’ve ever come to this kind of praise was a friend who complimented me on having it “all zipped up,” but I assume she was talking about my pants). I’ve never been a huge fan of housework. This probably springs from growing up in the cleanest house ever. You may think that your moms kept their houses clean, you many even think that YOU grew up in the cleanest house ever, and that’s very sweet…but you’re wrong. Of course, the natural outcome of growing up in the cleanest house ever was that I vowed never to spend as much time cleaning as my mom. And the PROBLEM with this is that I have high standards of cleanliness — I can see the mess, it bothers me — but I don’t want to be the one dealing with the mess. It gets ugly, I tell you: it’s like Fight Club up there in my brain, with Tyler Durden played by my cleanliness standards. My war with myself over housework had the potential to become a huge problem when we moved to Vermont. Back in Berkeley, our family rented a 900-square-foot, 2-bedroom, 1-bath bungalow; upon moving to Vermont, we tripled our living space. I’m still embarrassed about this, because I’ve never considered myself a Big House Person. Big houses tend to get filled up with more stuff (I fear accumulating too much stuff), and they tend to require more time spent cleaning (enough said). But we chose the house we are in because: (1) we had 3 days with a month-old baby to find a place, and this was the obvious best choice, (2) we are now a family of 5 and also want space to host people (especially grandparents), (3) we moved to Vermont, where real estate is waaaaay cheaper than anywhere else we’ve lived. So, here we are, and I have to say: the housework hasn’t been so bad. 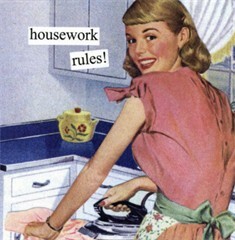 How have I managed the increased housework load? Well, I had this little revelation shortly after we moved here: Did you know that big tasks become more manageable if you break them into smaller pieces? (That’s how it is with my revelations: takes me a decade to achieve an “Aha!” moment, to which everyone else says, “Duh!”). For instance, it doesn’t take long to clean one bathroom (at least not the way I clean a bathroom). We have 2.5 bathrooms, so I clean one a day on Monday, Tuesday, and Wednesday. And so on with the other chores. (This all, of course, until I can get the girls to take over for me — and trust me, that’s already beginning). Eat your heart out, Good Housekeeping! Aside from basic housework, however, we have another issue: creeping kids’ stuff. Back when we had only one child, I was determined that kids’ toys, books, and other kid-related paraphernalia would not take over our house. When I was growing up (in the cleanest house ever) there were certain rooms that were set aside for adults, like the Living Room and the Dining Room. It seemed right and proper that adults — who, after all, OWN THE HOUSE — should have spaces where they can walk freely, unafraid of stepping on Legos or tripping over Exersaucers. We handled the problem of kids’ stuff in our Berkeley bungalow by stacking everything in a towering pile in one corner of the living room. But that pile grew and grew, and we kept having more kids. Then the older kids needed new toys, because an Exersaucer isn’t much fun when you’re 3, but the new baby still needed the old toys, so we couldn’t get rid of them. The kids’ stuff took over our house like kudzu. Moving to a bigger house should have solved the problem of creeping kids’ stuff. But it didn’t. Here was the plan: in our new house, we have a room we call the Rec Room. It’s a funny room built over the garage, up a small flight of stairs from the Mud Room. As such, it’s separated from the rest of the house in a way that makes it unusable for much, but PERFECT as a dumping ground for kids’ toys. 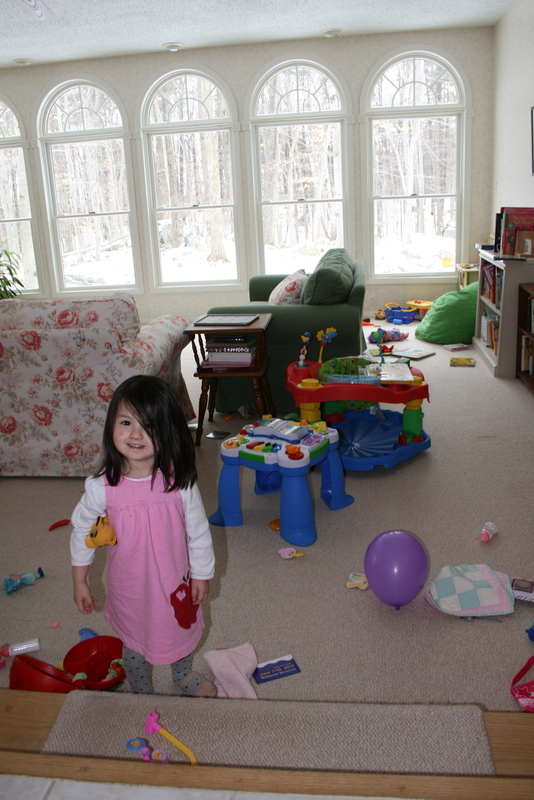 The idea was that all of the girls’ toys would live in the Rec Room, keeping the rest of the house clutter-free. It hasn’t worked. 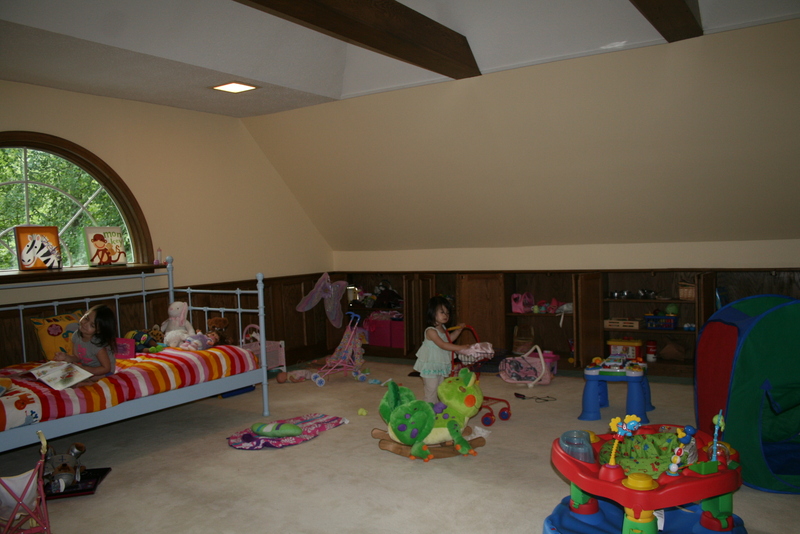 Oh, the girls were initially excited about having a toy room, but they quickly saw through the plan. The first problem is that the Rec Room is far away from wherever I tend to be. Of course, this is precisely the point, but it turns out that our girls prefer to play directly underfoot so that I’m immediately at hand to help them change clothes 53 times, mediate disputes every 3 minutes, and wrestle Barbies into complicated outfits. Then winter came, and the problem became one of climate. Our Rec Room is so cut off from the main house that it has its own heating zone. It’s also cut off by a door that we close in the winter to keep cold air from the garage/mud room from entering the main house — which means that the heat from our wood stove doesn’t reach the Rec Room. In other words: the Rec Room is completely impractical to heat, so during the winter it’s freezing. Unless I go up there an hour in advance of any playtime to crank up the heat, the girls have to wear full winter gear just to play with their toys. The girls and I tidy it up, but the creeping kids’ stuff inevitably re-explodes. So I’ve decided to relax. I’m not going to waste too much time or energy fighting it. 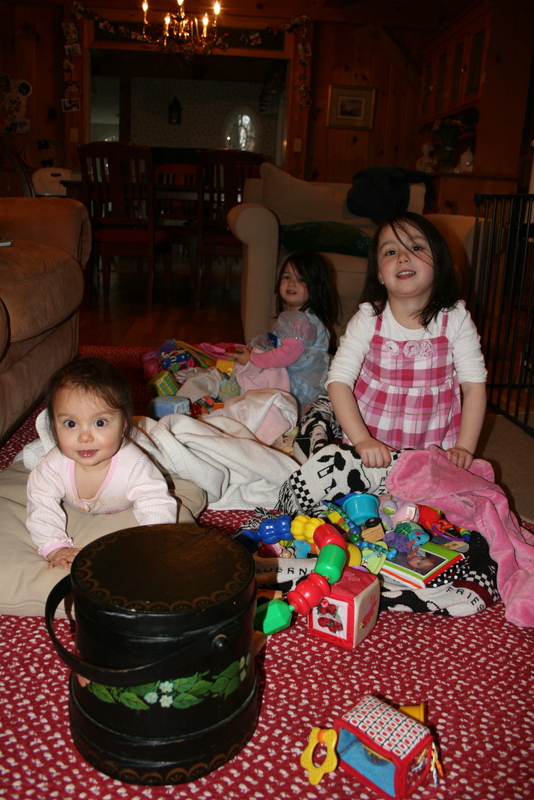 These kids outnumber us now; it’s natural that their stuff is taking over our house. Instead, I’ve decided to file this situation under the “I have three young children” excuse. This is another nifty revelation of mine: if you have three young children (say, between the ages of 1 and 4), most people tend to cut you a lot of slack. My theory is that they’re just so relieved that you’re not lying on the floor sobbing with exhaustion and desperation, that people are willing to excuse all manner of bizarre behavior from mothers of young children. Behavior that in any other situation would earn me a label as a substandard person suddenly becomes perfectly acceptable, even understandable. Twenty minutes late? “I have three young children.” Wearing sweats for the fourth day in a row? “I have three young children.” Chugging a third cup of coffee and wolfing down old birthday cake for lunch? (That’s just a theoretical situation, mind you). You guessed it. Certainly Playmobile figures strewn across the carpet, applesauce on the walls, and marker on the couch fall into this category as well. Keep having more children, for as long as possible! That’s clearly the answer! I can get away with a messy house for years! What a revelation! I can’t wait to tell Erick when he gets home from work. Faith – I just really enjoy your writing. This being the gazillionth thing I’ve read of yours I decided to try and analyze what you do that makes your stories so engaging. Then I got bored with my analyzing, but realized that you do tell stories. In this one I want to relate to housecleaning – which I hate and don’t have three kids to excuse myself for the dust on things so I shouldn’t be able to relate. But, I laugh and sympathize at your travails. Your fun little stories have wonderful lead ins and I just enjoy reading what you write. Thought I’d let you know. Plus, it’s nice to hear how you, Eric and the girls are doing. Lovely picture of the snow outside your window, btw. Wow, Diane, thank you so much! Your comment is so kind, and made me walk around with a big smile on my face all afternoon. I LOVE writing, so hearing that people enjoy reading what I write is lovely. Also, it’s just great to hear from you. We miss you, Kyle, and the rest of the CA gang — hope you are doing just great. I covet the windows in your sun room. COVET. I am the same way: I grew up with a cleaning-fanatic mother, and so now I don’t want to waste my time like that. And yet…and yet…why isn’t anyone ever wiping the BACK of the toilet??? Can’t anyone SEE that scrap of paper that missed the trash?? AAAAAAAAAAAAAAAAAAAAAA. 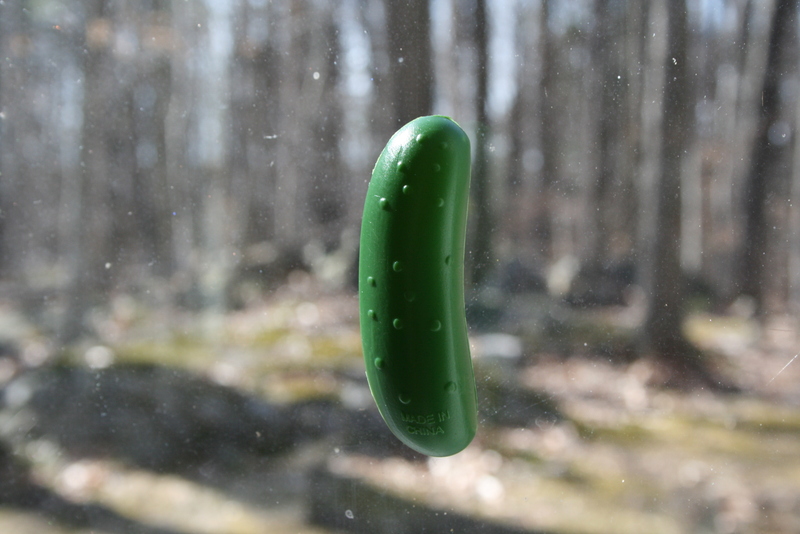 When you start coveting the sun room windows, just remember: THEY, TOO, HAVE TO BE CLEANED. And thank you for affirming my adult trauma as the child of a cleaning-fanatic mother!